I know the background of London Fields Brewery (LFB) founder and owner Jules de Vere Whiteway-Wilkinson was common knowledge to some beer geeks but it was news to me when this story was published in the Evening Standard last month. At the time there was much discussion on twitter, but it seemed to me some were unable or unwilling to differentiate between the man and the brewery, with some even apparently gleeful at the brewery’s apparent fall from grace. This made me wonder about the value we beer drinkers place on breweries’ business practices, including the terms and conditions enjoyed by their workers. We often extol the virtues of the artisanal nature of “craft beer”, and rightly so. But how much importance do we place on the health and wellbeing of the people breweries employ? And how much should we? I’ve often talked of my admiration of breweries that pay the Living Wage, and all the better if they are environmentally aware and are keen to play a role in the local community. But when the LFB story broke I found myself resolving not to let it ruin my enjoyment of its beers. This, after all, is the brewery that make the beer (Hackney Hopster) that introduced me to a London beer scene that was set to explode. This in turn led me to question whether I was a hypocrite – happy to pontificate from my armchair with a beer in hand with little regard for the blood, sweat and tears expended by the people whose beer I was drinking. On reflection I don’t think I was being a hypocrite – I have nothing but admiration for those who leave their previous life behind to follow their passion and hopefully make a success of it. And while an ethical brewery is the ideal, if we used this marker for every purchase we make then in no time at all we’d all be living on the streets, unclothed and hungry – as there isn’t much for sale in this world that isn’t the product of some degree of exploitation. I hope there’s a future for LFB and its team; if it can’t continue in its current form maybe a larger brewery will take it on as a “craft” subsidiary, or perhaps one of the other rapidly expanding London-based “craft” breweries could step in to some capacity. For me, all of this has taught me to be more contemplative about what goes into making beer, and the people, all of the people, behind the beer. And it has made me less preachy – who the f*ck am I anyway? The Bono of “Craft beer”? 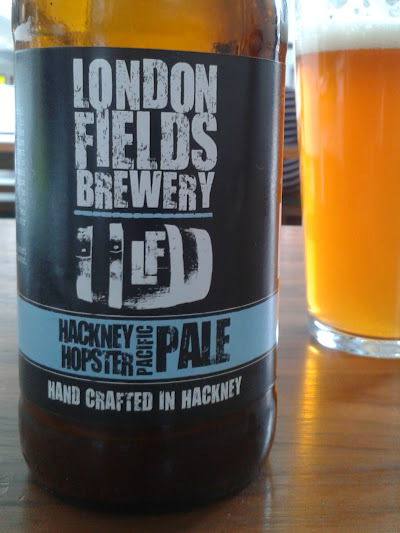 This entry was posted in Beers and tagged Craft Beer, London beer, London Fields Brewery. Bookmark the permalink. I was also unaware of the goings on with LFB… must admit I am gutted! I found out days after visiting the taproom for their Texan Tea release party! They have made some awesome beers in their time but I have noticed recently some of their beers (especially bottles beers) have dropped in standard a bit! I had to throw some of the Harvest Ale was very disappointing! I have two bottles of theirs at home… may hold on to them and turn them into collectors items! I agree the beers aren’t what they were but I still rate Shoreditch Triangle and I like the Tap Room, it’s got “vibe”. The tweets from the various accounts are verging on spam though, no effort to meaningfully engage with their customers at all.